Product demo: Eurol Specialty Lubricants in comparison to regular grease | Eurol B.V. 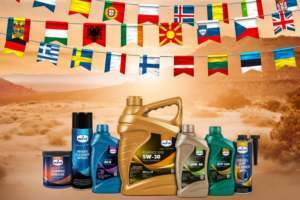 The Dakar Rally has proven that Eurol Specialty lubricants lubricate and protect optimally, even in the most extreme conditions. This demonstration film shows the high quality of the Specialty Lubricants in comparison with regular grease. With the cooperation of the Mammoet Rallysport Team we subject our products to extremely high pressure loads, varying temperatures and contact with moisture and dirt on a small scale. It is precisely these practical conditions that ensure more wear and higher energy consumption. Eurol Specialty lubricants ensure lower maintenance costs, fuel savings and better operations. Har du ikke en nummerplade?